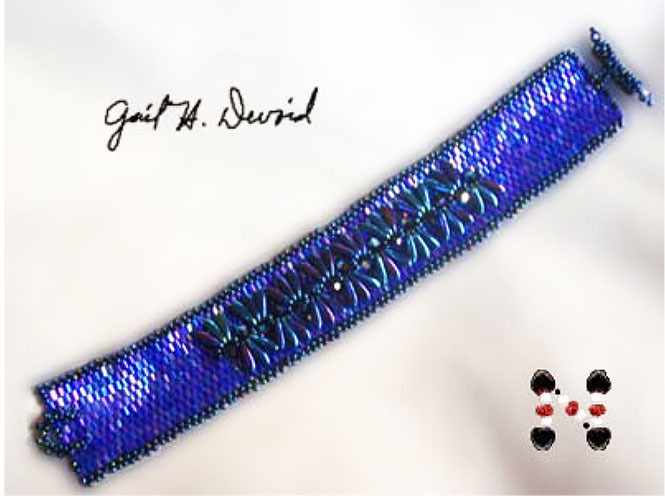 Inspired by Cher Lash’s 2-needle Aloha Bracelet, this bracelet pattern creates a variation that uses a one-needle method of creating a strand that embellishes the bracelet’s band. The pattern includes several illustrations that help a beginner expand his/her knowledge of peyote stitch, RAW, and picot fringe. An instruction section for a peyote toggle that is embellished with crystals is also included. Material list includes sources for beads, and suggested materials for thread to ensure strength, stability and success with this pattern. 7.5 inch bracelet. However, you can lengthen or shorten the bracelet by increasing the materials used.